The forecast during Tuesday afternoon indicate that the powerful Hurricane Irma is approaching the northern group of the Lower Antilles at a speed of 24 kilometers per hour. According to the tenth Tropical Hurricane Advisory issued by the Meteorology Institute, Irma maintains a path towards the West and continues intensifying over the waters of the Atlantic. Due to its intensity, Irma is a dangerous category 5 hurricane in the Saffir-Simpson scale of a maximum of 5. 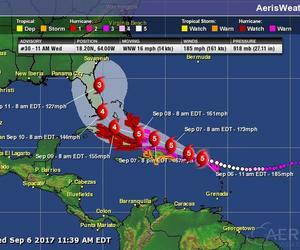 The Cuban people and State entities must be informed on the development and future trajectory of the hurricane. On Tuesday 6pm local time, the center of the hurricane was estimated at 17.1 degrees North Latitude and 60.0 degrees West Longitude, located 190 kilometers east of Antigua. During the next 12 to 24 hours, Irma will maintain a similar path and velocity and gradually inclining its track west-northwest with fluctuations in intensity while striking a portion of the northeast of the northern group of the Lower Antilles. The Meteorology Institute will issue the next Tropical Hurricane Advisory on the hurricane on Wednesday at 6am local time. Meanwhile, the Cuban population must pay close attention to instructions issued by the Defense Councils in each territory in order to confront the threat of Irma with order and unity. Taking into account the characteristics of this extreme hurricane and predicted trajectory, the National Civil Defense has decided to establish the Information Stage for the provinces of Guantanamo, Santiago de Cuba, Granma, Holguin, Las Tunas, Camaguey, Ciego de Avila, Sancti Spiritus, Cienfuegos, Villa Clara and Matanzas starting 3pm Tuesday. The Provinces of Havana and Mayabeque must remain alert to further information of the Meteorology Institute.